OregonGrown™ plants are outstanding because of the state’s rich soil, ideal climate and concentration of skilled growers. In 2016, nursery and greenhouse products reclaimed their place as Oregon’s top grossing agricultural product, selling more than $909 million worth of material. We thought you might like to meet the people behind these outstanding numbers. Meet the masters: Explore four nurseries that demonstrate Oregon’s strong diversity of growers with a huge variety of plant materials. Terra Nova Nurseries Inc. Four friends who love plants create an improbable global powerhouse of plant breeding and tissue culture production. KCK Farms Inc. Two brothers build a successful nursery and farm through strategic agility, crop diversity and sheer resilience. Russell’s Nursery Three generations of the Russell family find success by betting big on their products and their customers. Amethyst Hill Nursery/Hydrangeas Plus® David and Kristin VanHoose escape the corporate world and embrace the nursery lifestyle. Growing Knowledge, an ongoing series provided by Oregon State University in collaboration with the USDA and in partnership with OAN. Stink bugs dining at nurseries: The brown marmorated stink bug (BMSB) has steadily caused concern for nurseries selling non-fruiting crops. Please send your comments on the issue to editor Curt Kipp at ckipp@oan.org. 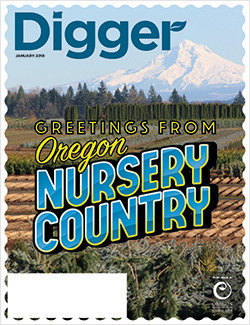 Explore the Nursery Country Issue Archives!